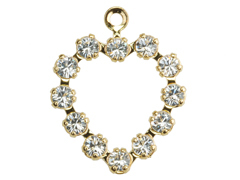 Add an exquisite touch to your jewelry designs with our glittering Swarovski components. These uniquely crafted Swarovski components sparkle with embedded crystals and can be used with our shimmering pearls and dazzling crystal beads to create eye-catching bracelets, necklaces and earrings. For inspiration on using these brilliant Swarovski crystal components in your original designs, please visit INM Crystal’s Idea Gallery.